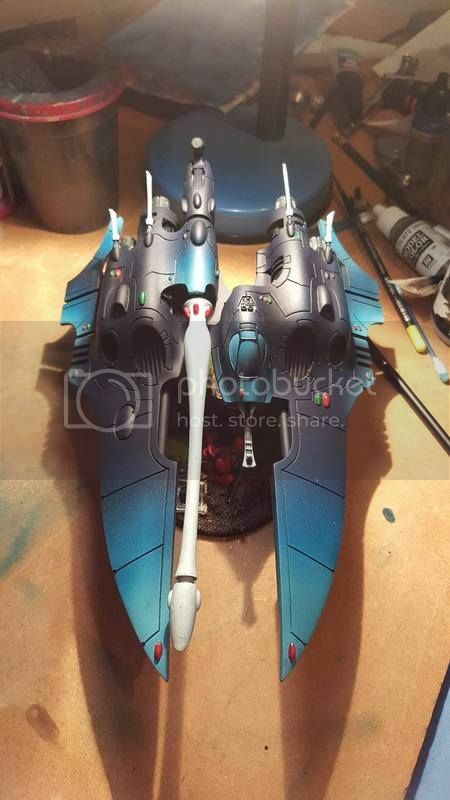 Topic: Aurics Pride's Projects- Corsairs, Raven Guard, Daemons and now Dark Eldar! 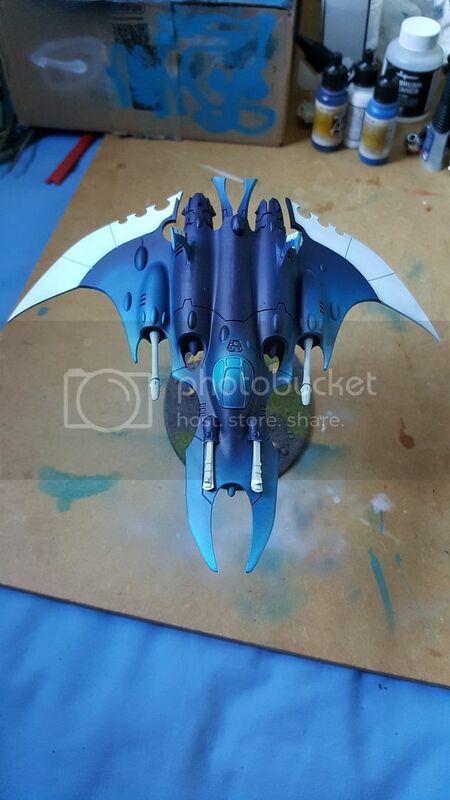 Aurics Pride's Projects- Corsairs, Raven Guard, Daemons and now Dark Eldar! I've been away for a fair while (Forums and the hobby) but after circumstances changed again recently I fell headfirst back into the hobby and have done so with a vengeance! I decided to start a new project and as much as I try to stop myself I just seem to be drawn to Eldar constantly and decided to give Corsairs a go. I loved the Forgeworld models when they were released but at the time I really didn't want to spend Forgeworld money on their models, now there is a smaller gap between Forgeworld and Games Workshop's pricing I figured what the hell! After seeing Cavalier's models everywhere I searched and sitting and staring at them in awe for a while, I decided to really go all in and to start up a blog to help with the motivation and hopefully to keep me a bit more organised! I have made a start already but will be posting up the rest as I go, at the moment I only have the one model finished which is a Lynx. 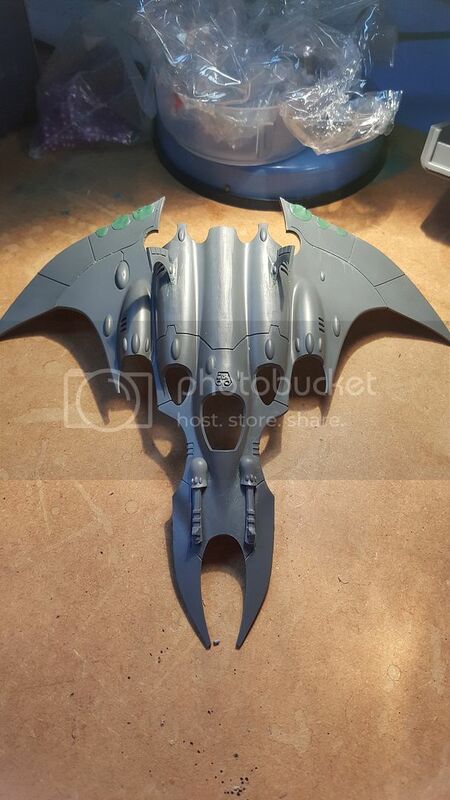 I am just about to start a conversion project to make a Razorwing into a Nightwing (Not a fan of the old model). It won't be anything ridiculously fancy or complicated but I will try and post up a few WIP shots as I go through it. That's a really impressively painted Lynx. The way the different shades of blue flow into each other is really striking and very well executed. that's indeed a very good flow of colors. It's a very nice gradient, and the color spots are well divided over the whole thing so you get a nice balance. To be honest I'm a bit of an airbrush newbie and it turned out better than I could have imagined! 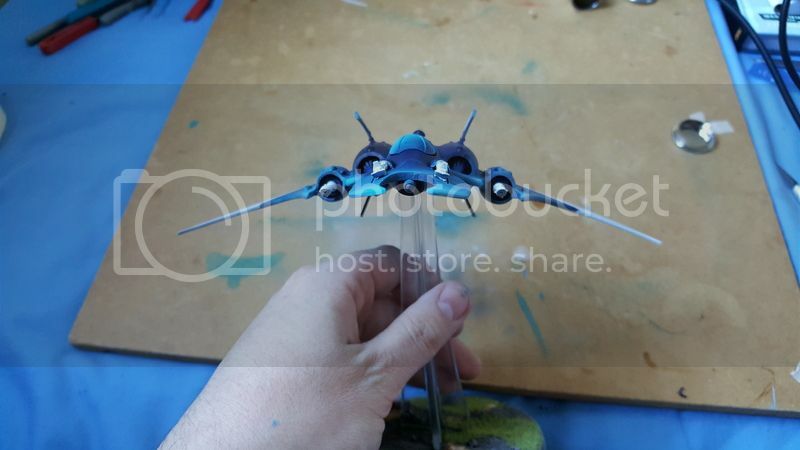 The colours used for it are Vallejo Model Air Storm Blue for a base and a 4:1 mix of Dead white and Storm blue for the light blue, using the airbrush to get the gradient and then I used French blue lightly in the gradient to make it flow a bit better. I just need to finish the Gems etc on my Prince and Reaver squad and I'll post those up too. Wow off to a hot start! Welcome back to to the forum, super awesome to have another Corsair player in the project logs! The Lynx looks incredible man, the fade is very nice, and really helps the pulsar standout. Its funny you mention seeing my stuff everywhere. Whenever I hop onto to google image search to try and find some new Corsair inspiration all I see is my own damn stuff. Its really frustrating! Also love that you are converting a Razorwing to a Nightwing. I did the same thing and I'm very happy I did (although I own an actual Nightwing as well). My only warning to you is that the Razorwing model does have some issues. Getting the hull to clamp down with no gaps can be a bit of a pain. But one of my friends showed me how to fix it. So let me know if you have any issues I'd be happy to help. Anyway congrats on starting your new army man. Make sure you keep us posted its gonna be great following another Corsair players army progress! I've spent a few hours on the Razorwing today and managed to do mostly all the changes that I wanted to. Mainly the plan was just to make it look less Dark Eldar-y and try and keep the sleek look to the model. My biggest issue so far has been using green stuff to fill in the holes on the rear of the wings, I'm not the best at using greenstuff and I've had two attempts fail pretty miserably. I have filled them again and am now going to leave it until tomorrow for it to set. Otherwise fairly happy so far, not sure what else I could do at the moment. I've kept to the same palette so hopefully they fit in pretty well with the vehicles although obviously it'd be tough to do the same blending on such small models. hah! Yes, do I ever know that. Painting always looks worse on photos. I don't think your models look bad though, and I really like your color choices. Keep it up, I'd say! They look pretty damn good to me! Don't worry about it man, the photos enlarge the minis to enormous proportions and they always look better in person. It may be the photos but the paint does look a bit thick on the helmets though. Its a real easy fix though, just prime the heads seperate and prime them white on the next batch of guys. I do that kind of stuff all the time. It may seem a pain in the beginning but it saves you grief at the end of the road. 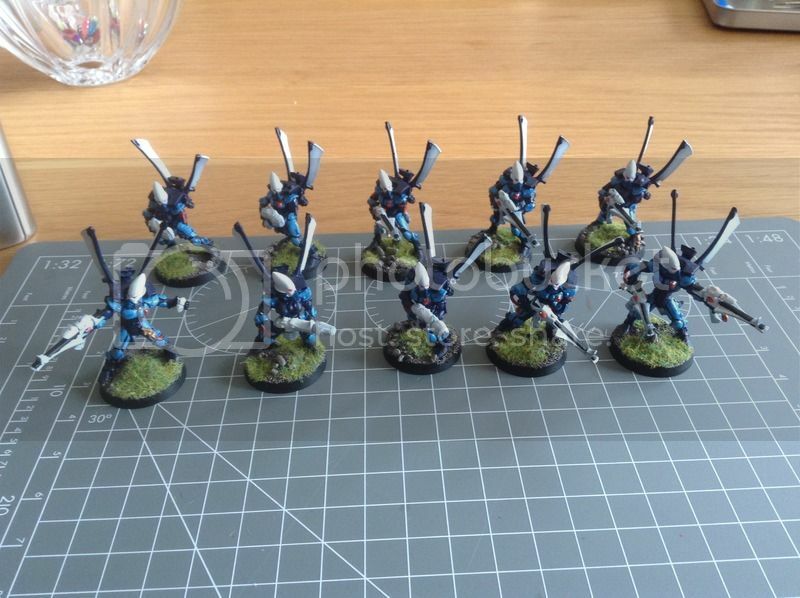 I did that with my counts-as Warp Spiders which all have white heads and boy was it a time saver. Anyway though like I said they still look very very solid. I really like the way you patterned the colors. White helmet, wings and guns are very very striking. Nice job on the Nightwing BTW. I went for the big honking Shuriken Cannon where there the Splinter Cannon goes, but the original Razorwing-to-Nightwing conversion I saw looks very similar to your and I really like it. Anyway cheers on the great progress man keep it up! Thanks guys, the camera definitely isn't too flattering to them! @Cavalier- Yeah frustratingly I started off with the Helmets airbrushed but the primer obviously didn't stick too well as the white kept rubbing off while I was painting the other areas so I had to touch them up using brush. I have a few Helmets ready for a Balestrike band conversion (Similar to yours using Scourge legs). Will see how they do. Yeah I've seen a couple similar to what I've done, to be honest there isn't a huge amount else that I can see you being able to do to it without some seriously cutting and sticking! I should hopefully get it finished building over the next week or so ready to be painted. Here is my almost finished Corsair Prince, just need to do the Green Gems and finish painting the Space Marine on the base. Hey bud I've been there with fuzzy primer. Just the worst. Especially on those white helmets. I acutally botched the hell out of my Warp Spider heads. I popped them off dumped them in Simple Green and started over. But mine were TOTALLY botched not just a little thick on the paint which is no worries. But man your Prince looks incredible! GW did such an amazing job with that sculpt. The paint job is superb. The skin tone looks absolutely awesome. I love the use of the pale grey it gives a somber menace. Awesome stuff and a worthy prince to lead your host. Keep it up! 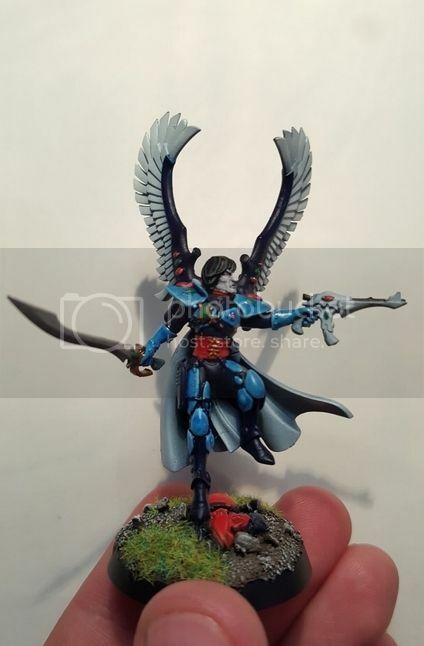 Thanks Cav, got to be honest I think that the Autarch model is one of my all time favourite GW models, such a great pose and so easy to put together. Really enjoyed painting it too. Nightwing has just finished the first couple of stages of painting. Got a little bit of tidying up to do on it and then will do the details. I think I am happy with it so far, the blending hasn't worked quite so well but I may try and touch up a couple bits of it. I still wish that I had been able to fill those holes in the wings but every time that I did the greenstuff wouldn't stay in and just kept popping out! Overall though I think I am fairly happy, will get the details done over the next few days hopefully and then it should hit the table on Thursday for it's first game. Nailed it! It looks great man. 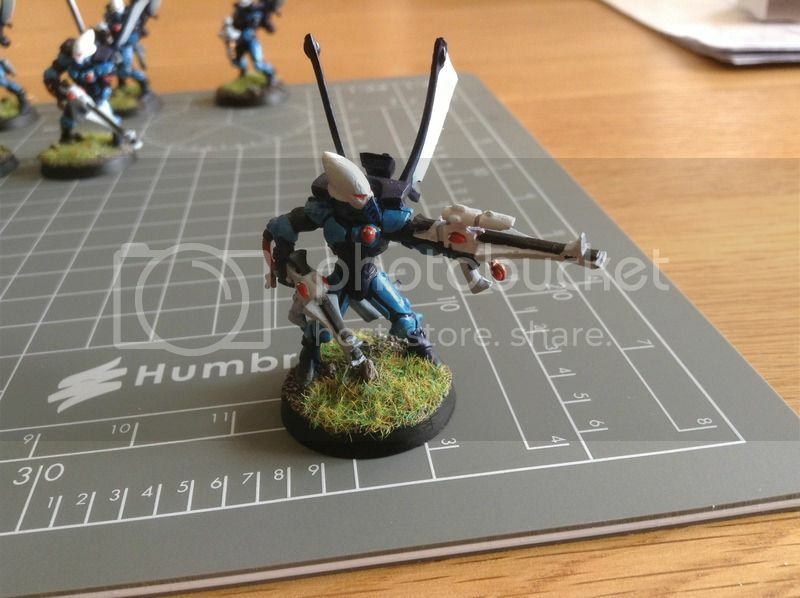 Love the subtle conversion with the wings and the shuriken cannons look awesome. Paint job is very very nice as well. How did you do with assembly? It looks super tight... share any tips you have because I've struggled with getting the top and bottom of the hull to join properly. I want to model up a second Nightwing but I'm really dreading assembly. Any tips would be appreciated. BTW you are gonna love this thing on the tabletop. They are such aces... the formation with ignore jink must be insane. Anyway great stuff man, super nice execution on the modeling and painting. Keep it up! To be honest with the exception of one small part of the hull it all fit quite well. I just made sure everything was completely clean of mould lines etc and did a couple of dry runs with the engine parts to make sure it went together ok. When I glued it I did the whole lot at once and made sure that I got a good coverage of glue on all contact points. I made sure that I applied a lot of pressure on all the major contact points as it set. I was sat holding it with both hands for about ten minutes haha. I am looking forward to getting it on the tabletop, definitely going to try the formation too although in my meta there aren't actually that many flyers. Nice job on the shuriken cannons. I've seen a bunch of conversions that just look a little off. Very well done. So my "Nightwing" is all finished, need to convert up a base for it but I've run out of moulding putty so that'll have to wait a little while. I'm pretty happy with the model I think, I can't work out whether to start doing some edge highlighting but I just get the feeling that it would ruin the effect of the blending if I did. I am also considering starting a new project but at the moment I really can't decide on what! I've been looking at quite a few ideas (Emperors Children, Tzeentch Daemons, Raven Guard, Iron Warriors) but nothing really has me as excited as the Eldar stuff always seems to, I do want a bit of variation in my games though. That blending does look super sweet. It makes me quite jealous! As for new projects - what are you looking for, other than a bit of variation in your gaming style? Something entirely different to paint, or something entirely different to build? Are you looking for things that you can paint quickly and off-hand, or something to throw too much time and effort in, covered in details? Are you looking at massive coversions or just a few small ones? An elite force or a great big mass of models? Cheers Vonny, the blending is a lot easier than it looks. The Airbrush was one of the best choices I've made since starting the hobby! 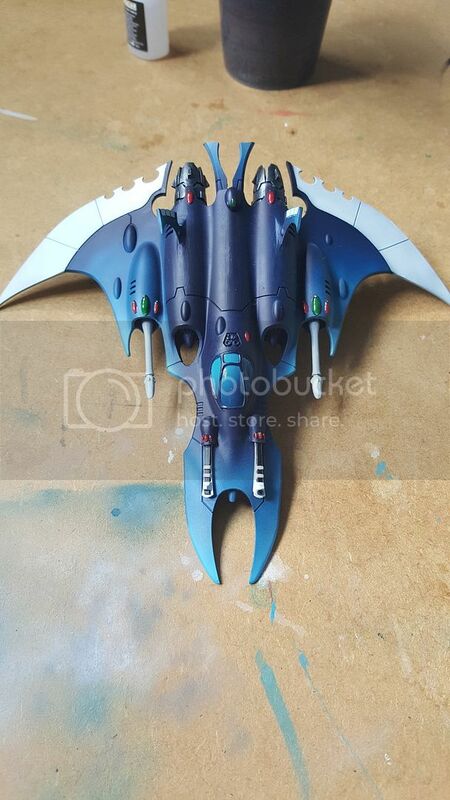 Realistically I am probably looking for an army where I can do a fair bit of Conversion work, I'd be doing it alongside my Eldar so can't throw a huge amount of time into it but like most of my armies I'm not a fan of using standard models and like at least making some small changes. I want something pretty different to my Eldar army, probably involving some big models (I want an excuse to buy, convert and paint a knight). I'd also like something with a bit of competitiveness about it, Chaos armies always appeal but the latest book is so bad if I am getting hammered week in, week out it's gonna feel like a bit of a waste to put all that time and effort into them for less than fun games. When it comes to the combination of an excuse to field a knight and opportunities for conversions, chaos does take the cake. With all the weird stuff they can get, and even weirder stuff you can build from that, there's no end to what you can do. Another option (that's been going through my mind) is to build a minotaurs army (loyalist space marine, forge world has chapter tactics and even some special characters for them) from the age of sigmar stormcast guys. I'm unsure how well they'd fit with the special characters from forgeworld, but it's a neat idea that you could look into. Killer stuff Auric! I love the paint job and the conversion work was spot on! Whether or not you could edge highlight... I think you could in just key areas. You don't have to do the whole thing. A really bright blue at the tips of the wings and nose, maybe a little near the "veins" or grooves in the middle. Nothing major just some subtle edge higlights. But its totally up to you. I think it looks great and if you didn't want to push it any farther I still think it'd look great. Really love this piece. It reminds me of a sea bird or something. Great stuff. As for a new project, Raven Guard are awesome at the moment! Plus they have INSANE Forge World models that can really help them stand out from their fellow Astartes-bros.